"fathered by valuable stallions that have escaped from Centralian stations". IDRIESS, Ion. L. Lasseter's Last Ride. 31. Brumbies are feral horses found throughout the continent, they have adapted well to the environment and in parts have flourished to its detriment, they are widely thought of as destructive pests. 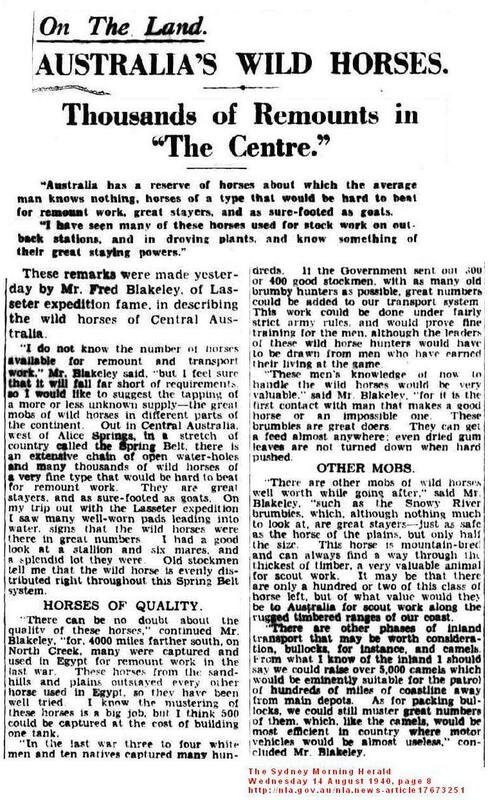 There has been some remarkable nonsense written about the noble pedigreed brumby, progeny of "valuable stallions that have escaped from Centralian stations", it's a common theme in brumby lore and even Melbourne Cup winners have left their mark in the remote outback! Wild and free they may be, but well bred they are not. Inbred by several decades more likely and in the case of Central Australia, the first escapees from the mob probably established themselves during the construction of the Overland Telegraph Line in the early 1870s. They suffer the usual equine ailments but without the treatment of course, and have little stamina, due in part to the above and indifferent feed, and except for the occasional genetic fluke are not worth the trouble of catching and breaking in. Captain Blakiston-Houston had a keen eye for good horses, as an officer in the Royal Hussars probably would, and on his three day layover in Alice Springs waiting for the 'Ghan to return him to Adelaide, he took the opportunity to assess the local stock by travelling to Loves Creek Station where he met a horse buyer for the Indian Army. Of the 1500 assorted stallions, mares and foals rounded up over 1600 square miles, only 47 horses worth about four pound each were deemed fit to land at Bombay and even then the horses might not pass the stringent veterinary inspection. Blakeley Fred Dream Millions 75,76. Idriess Ion L Lasseter's Last Ride 30,31. Fearn-Wannan W Australian Folklore 95.